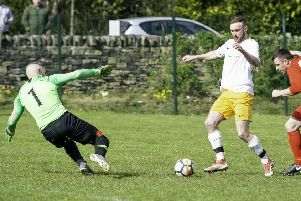 St John Fisher failed in their attempt to complete the first part of a double last Wednesday when they suffered penalty shoot-out heartbreak in the Heavy Woollen Challenge Cup final at Ossett Albion. Fisher were locked 3-3 after extra time against a Linthwaite side who had cruised to the Championship title, winning all 16 games. Matthew Bugg (two) and Aidan Schofield were the Fisher goal scorers in normal time but it was Linthwaite who took the spoils, wining the shoot-out 5-4. Fisher overcame their cup final disappointment to secure Heavy Woollen Sunday League Premier Division title with a 1-0 win over nearest challengers Woodkirk Valley. Woodkirk went into the game a point behind Fisher and needed to win to have any chance to snatching the title but Dominic Riordan scored the only goal of the game as Fisher won 1-0 last Sunday. Bottom side Heckmondwike Sports Club rounded their season off with an 8-5 win at fellow strugglers Mount Pleasant. Joe Bradley led the way for Heckmondwike with five goals, Kieran Senior netted a brace with Jack Hinchliffe completing the scoring. Overthorpe Sports Club finished third in the Championship after winning 5-0 against second placed Slip Inn Hounds. Elliot Brooke netted twice for he home side, with Jack Allerton, Tom Ramsden and Kristian Angus also finding the net. The Heavy Woollen District FA Brook Butler Cup semi-final between Navigation and Old Bank WMC takes place this Sunday at Beck Lane, with the winners meeting Mirfield Town in the final. n Fox and Hounds produced a remarkable comeback to beat Horbury Athletic and win the Wakefield League Division Two Cup at Crofton Community Centre last Friday night. Fox and Hounds trailed 4-2 with less than five minutes of normal time remaining but pulled a goal back before equalising with the last kick of the game thanks to a curling free-kick from outside the area. Fox and Hounds then scored the only goal during extra time to seal a 5-4 win and they needed to avoid defeat against Waterloo last night to clinch runners-up spot in Division Two.